Ladies, do you like the taste of chocolate? Have you ever wondered what it would be like to play with a man of color? Secrets Hideaway has what you are looking for. 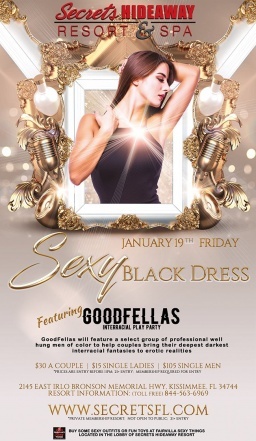 Friday night, for your delight, the GoodFellas will be here!!! GoodFellas will feature a select group of professional well hung men of color to help couples bring their deepest darkest interracial fantasies to reality.